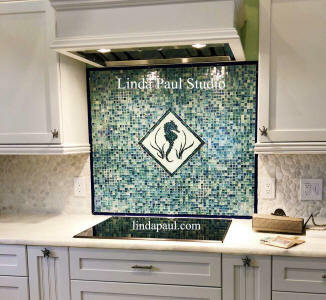 Need Backsplash Ideas for Coastal Kitchen or Beach House? 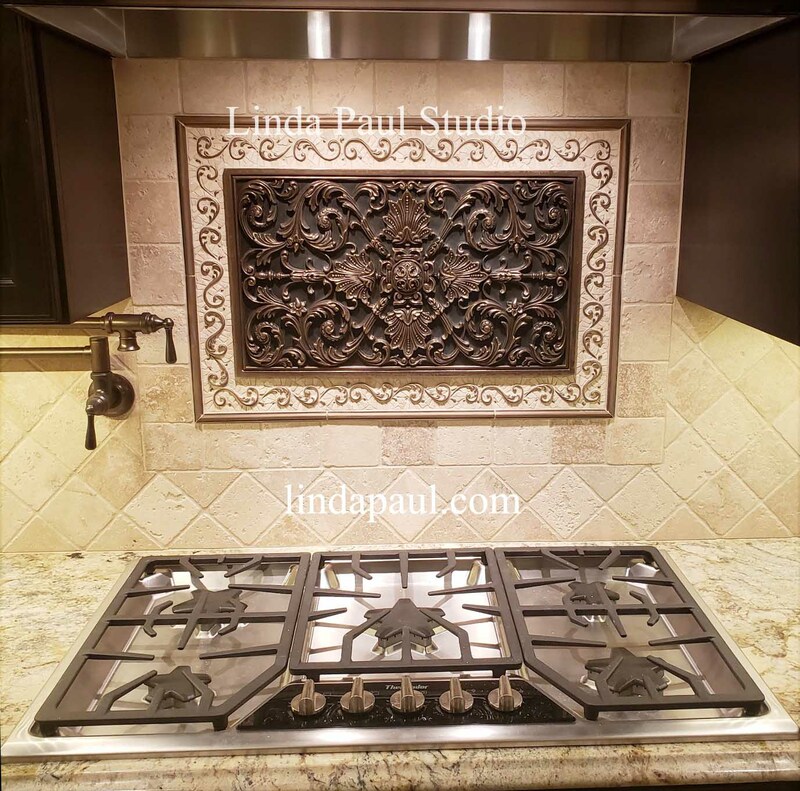 This installation picture shows our customer's kitchen with our stock fleur de lis mini medallion in bronze oil rubbed with S3 light travertine and S5 Noche mosaic stone tiles. Sunflower Field by artist Linda Paul. 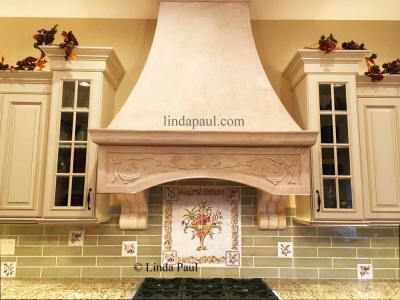 makes this kitchen stove alcove come alive with colors and spirit. 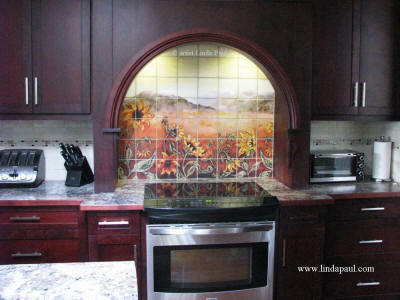 Tiles were designed to fit the alcove and the arch was cut onsite to fit. 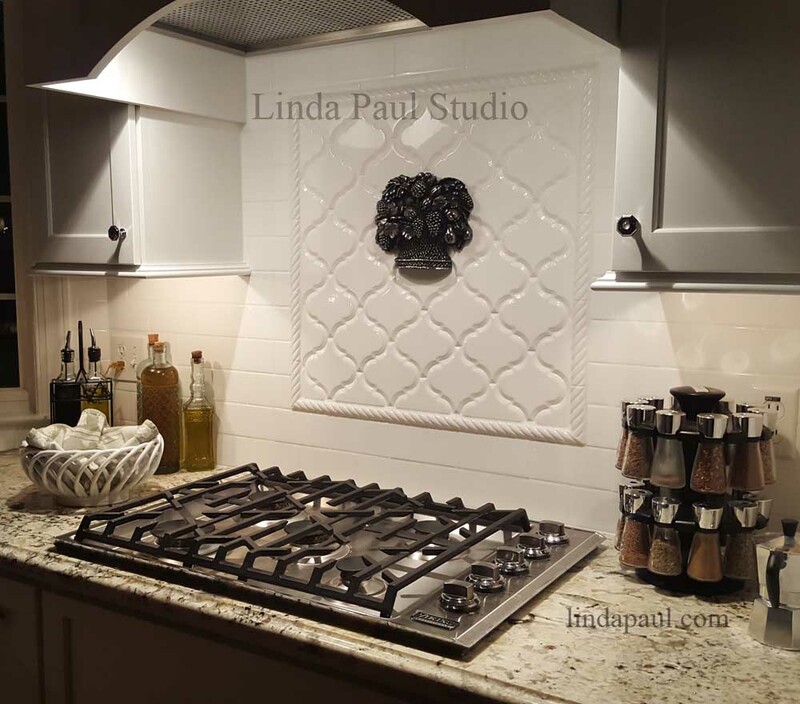 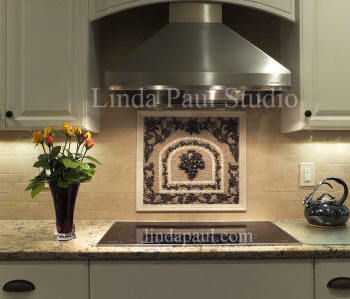 Matching leaf tile accents by Linda Paul over sink area. Beautiful installation of our Ravenna Onlay in copper oil rubbed. 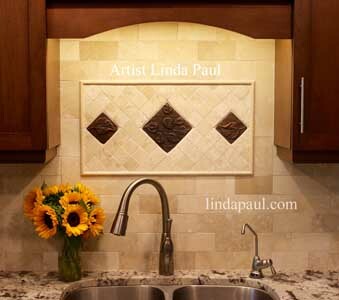 The installer was very creative with the diamond and dot tile and how he bordered the onlay . 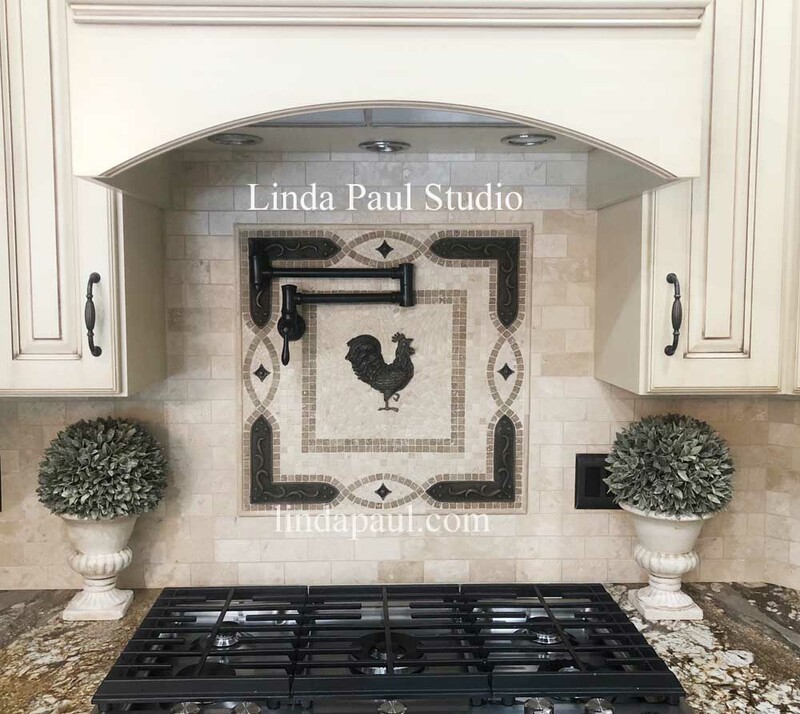 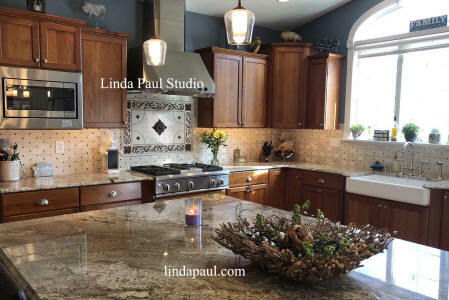 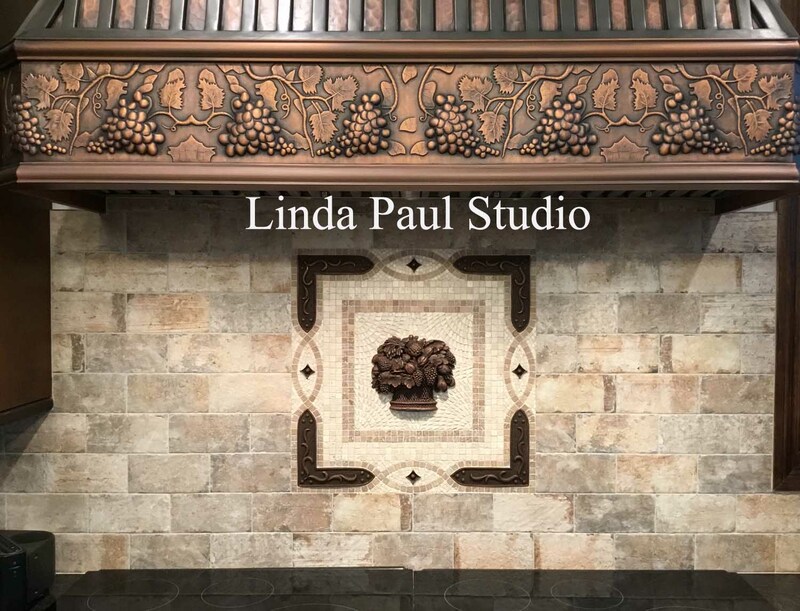 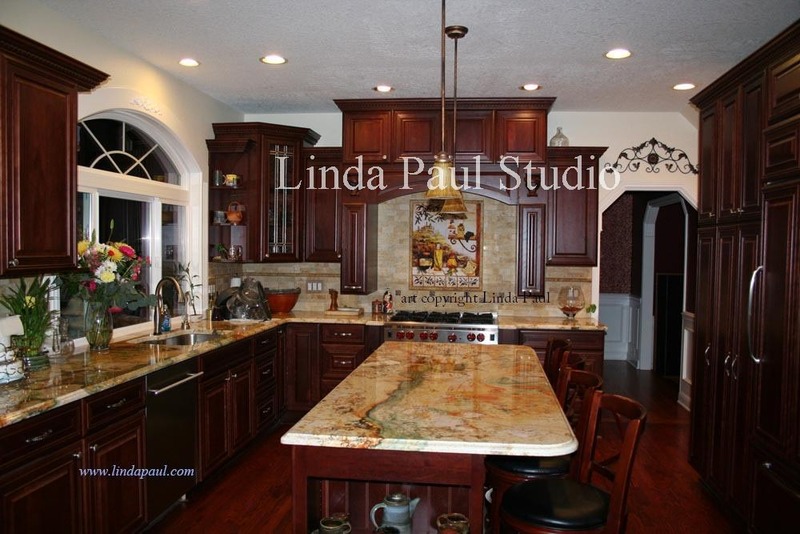 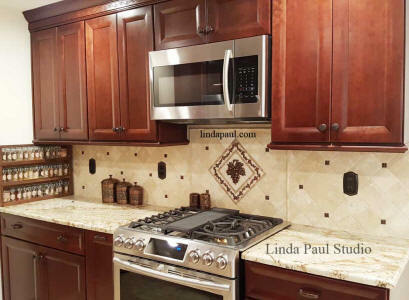 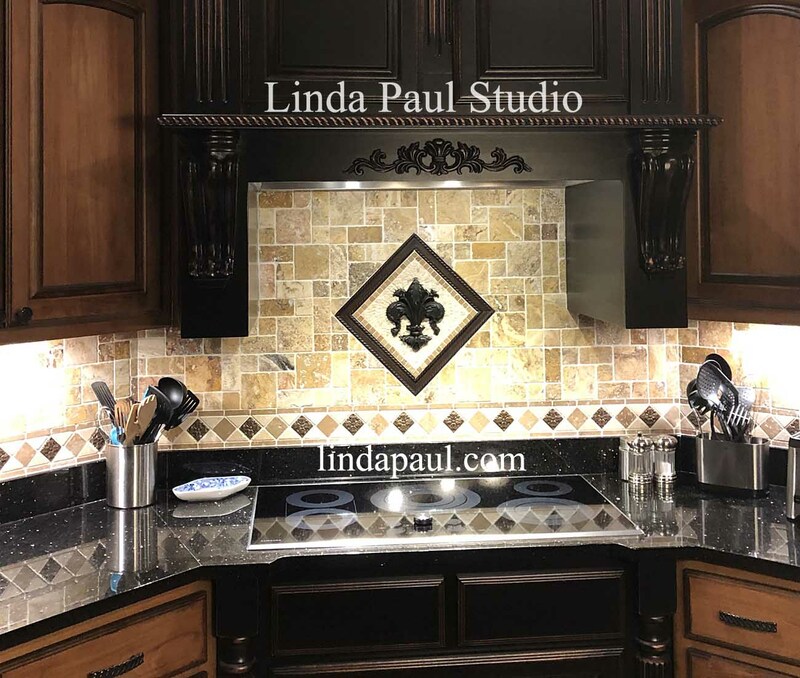 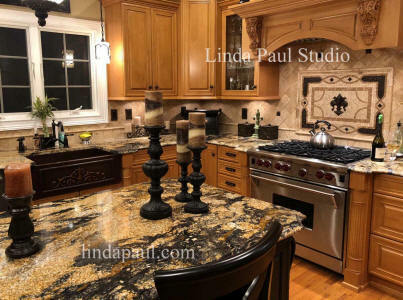 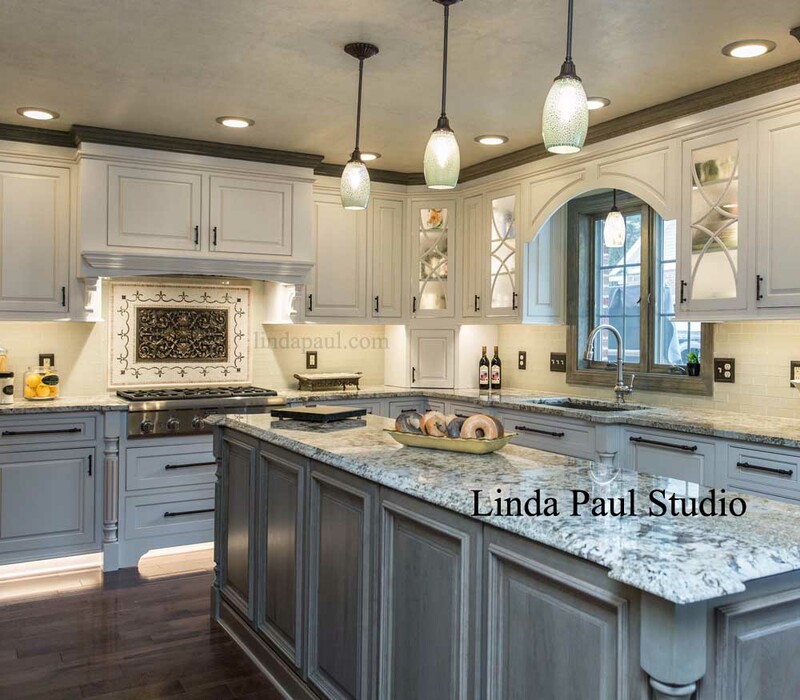 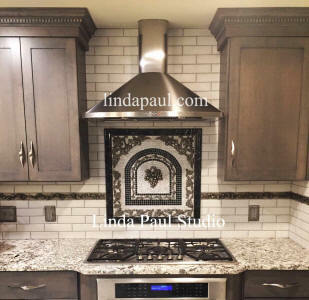 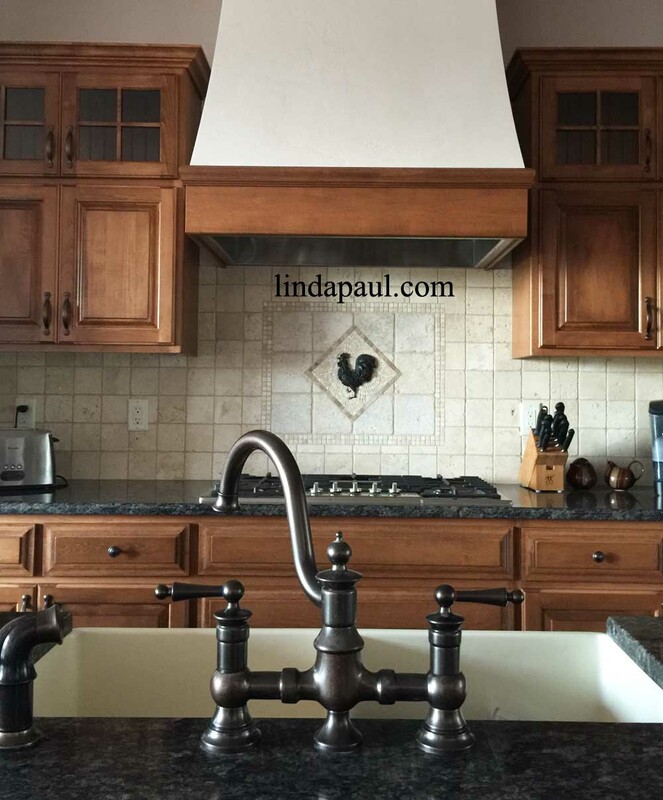 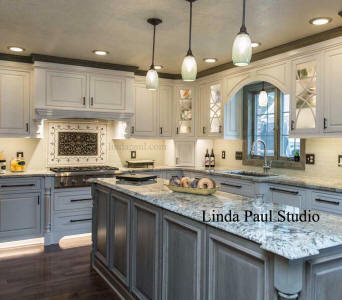 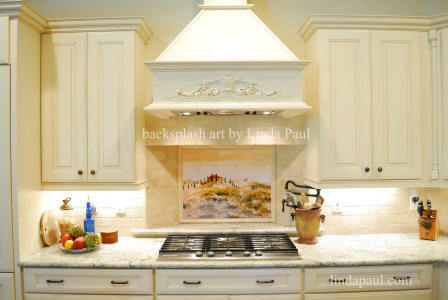 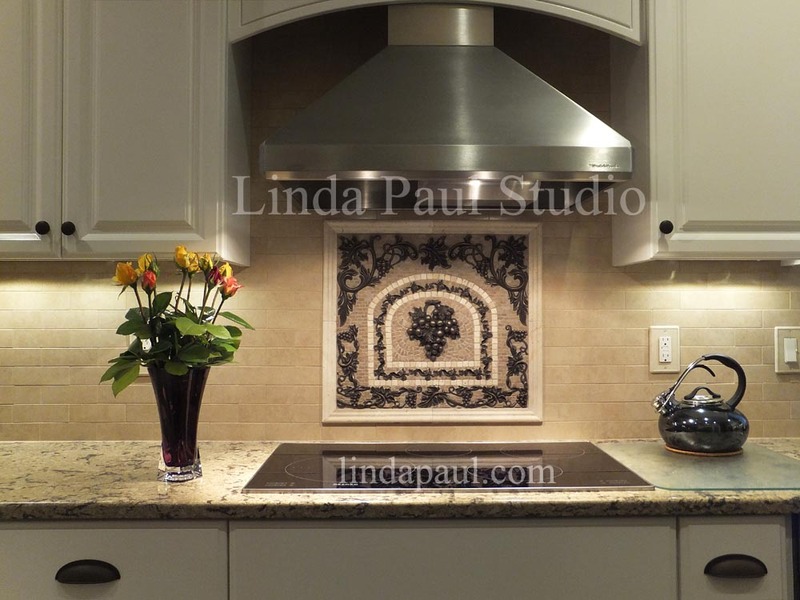 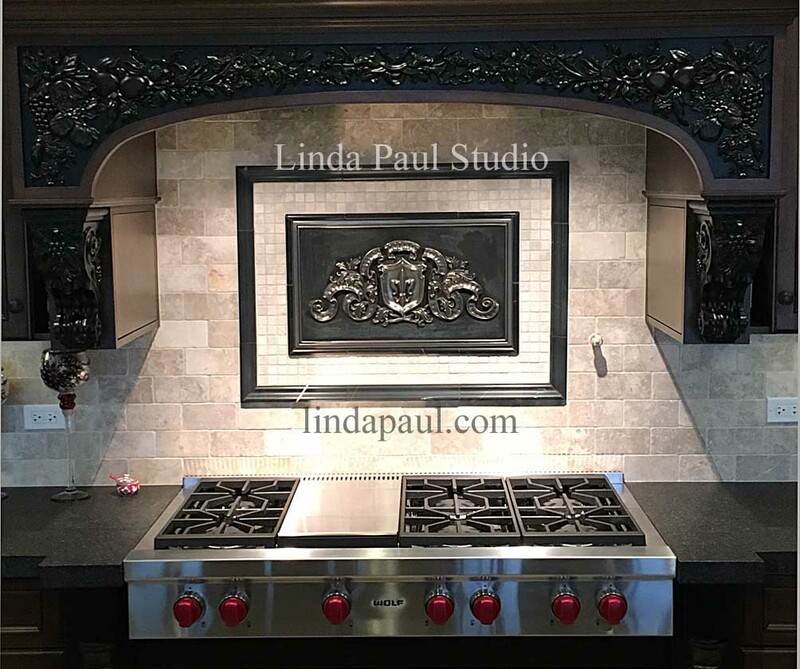 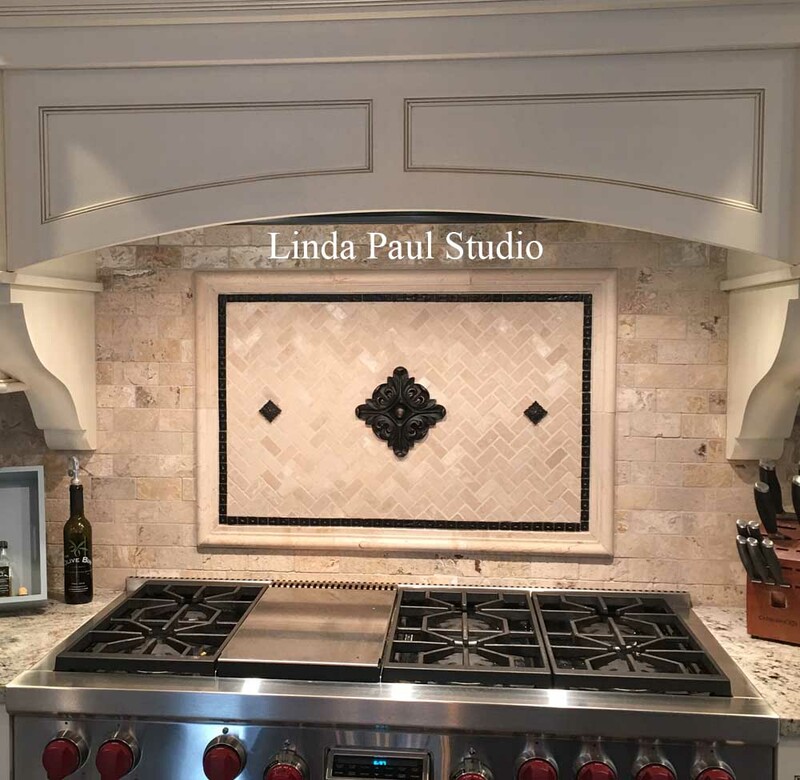 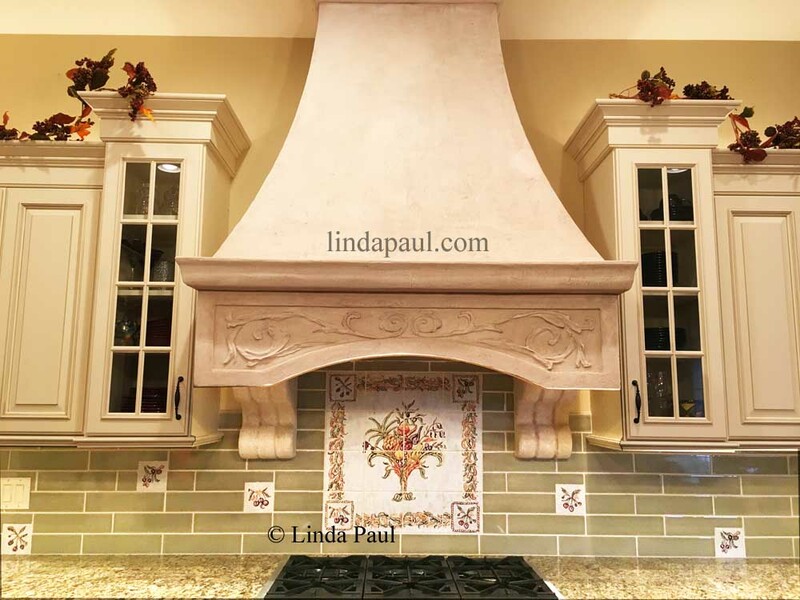 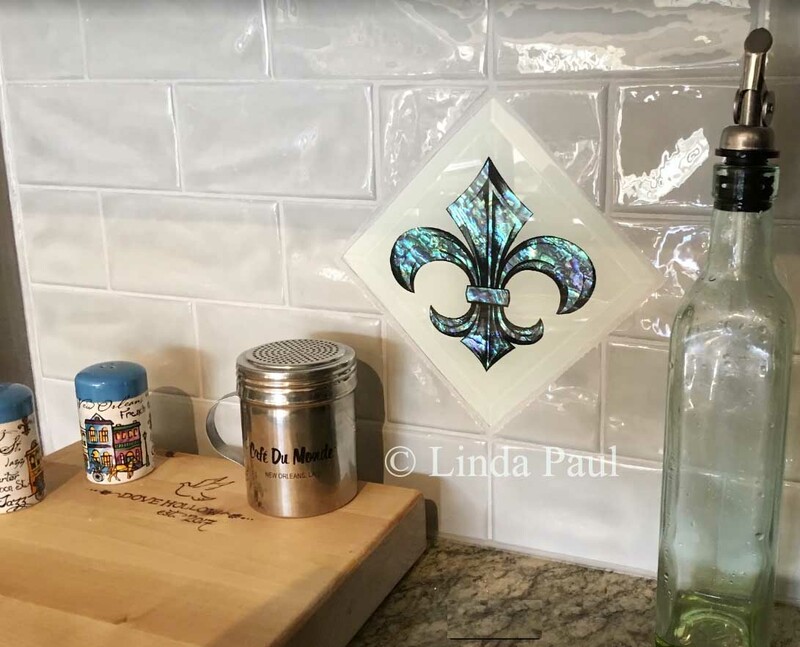 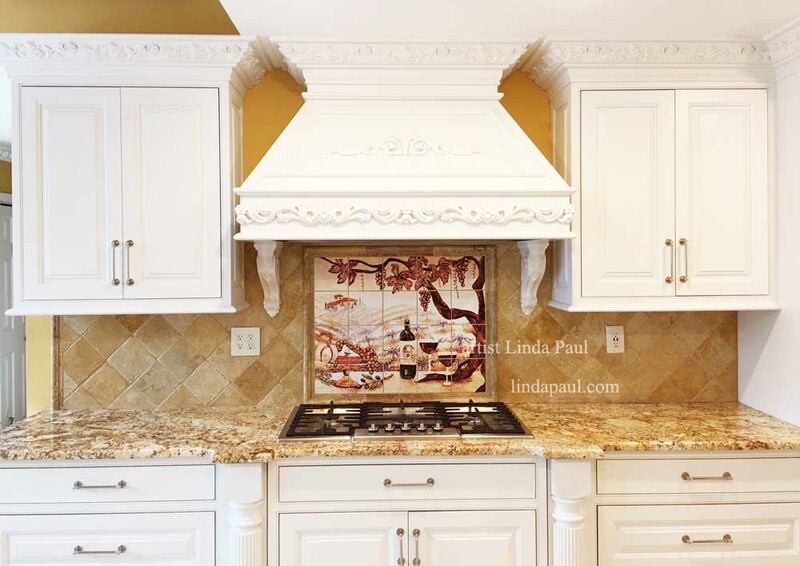 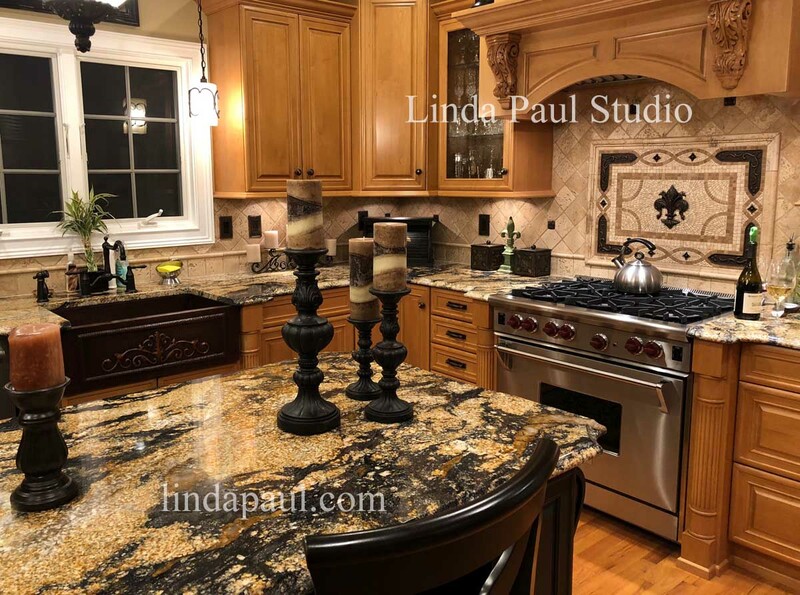 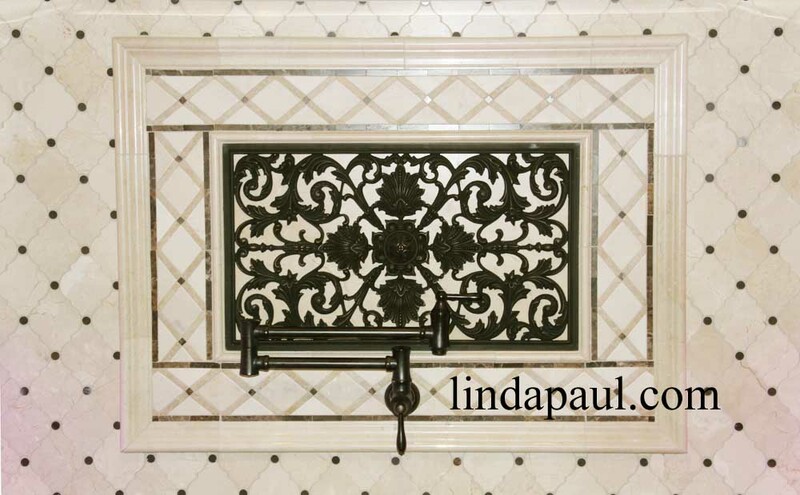 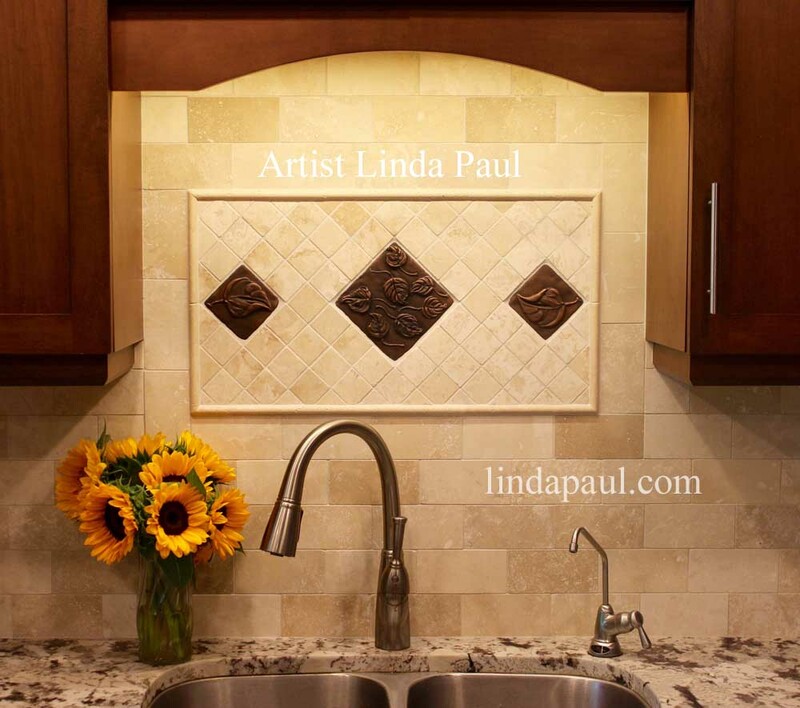 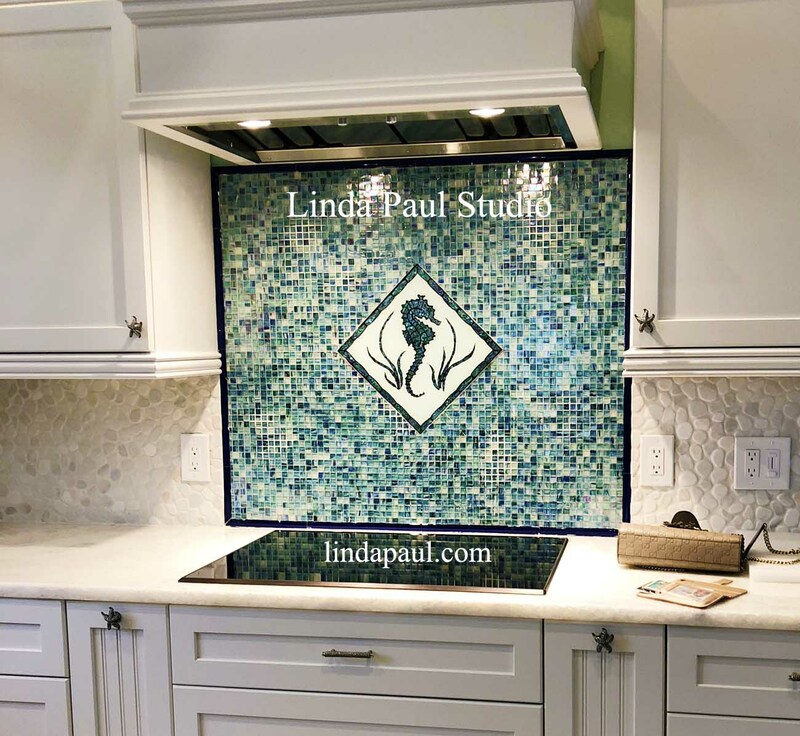 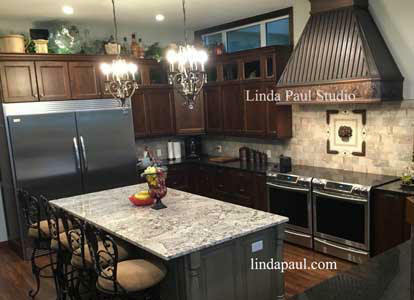 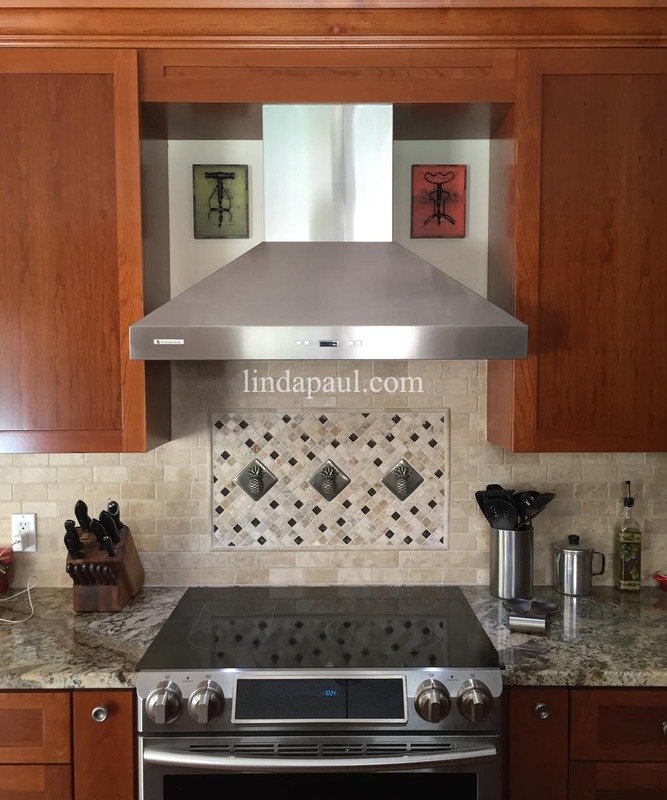 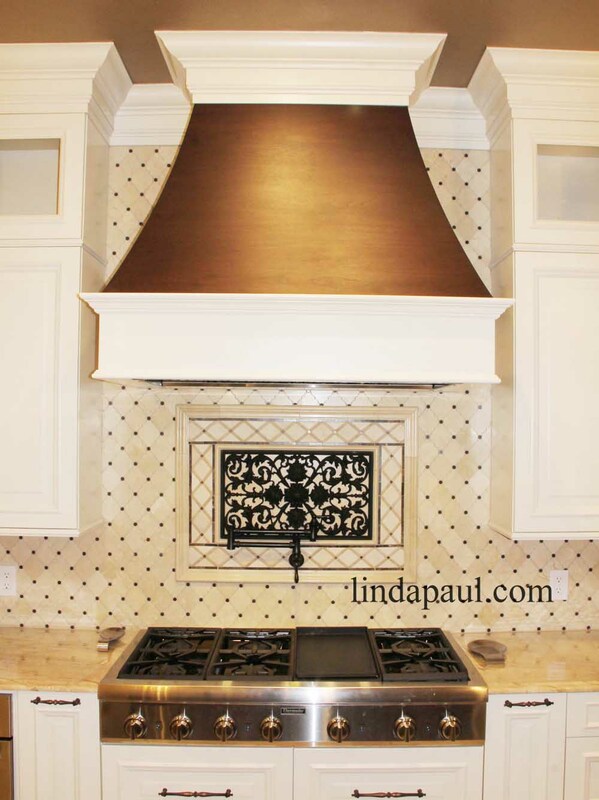 Sizing Tip from Linda Paul: To help you pick a size for your backsplash feature, cut out a piece of paper to the size you think you want the centerpiece to be, and then stand back and see how you like the proportion. 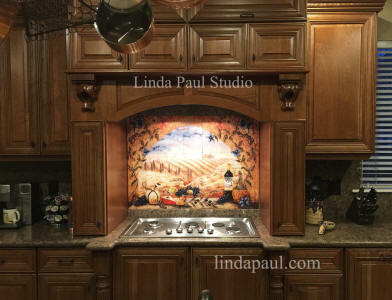 This picture shows our Vineyard mural in a classic white kitchen. One of our Australian customers sent in this picture of her Chili Pepper Kitchen tile mural. 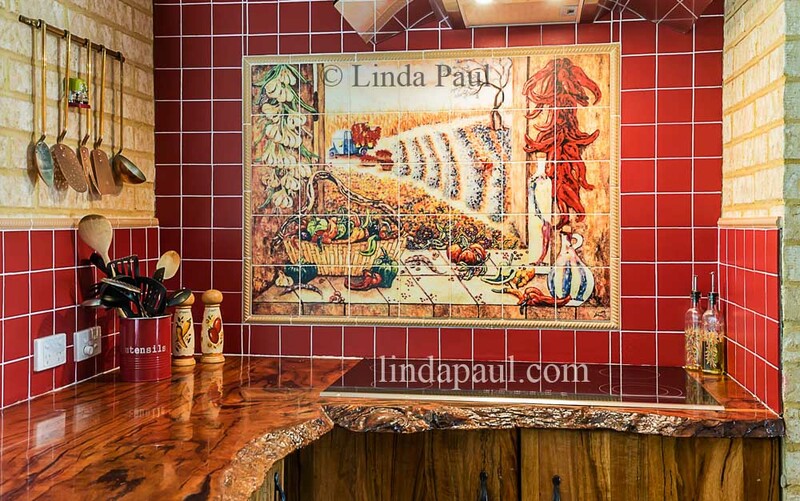 I love the red tile combined with the exposed brick and the natural wood countertop is amazing. 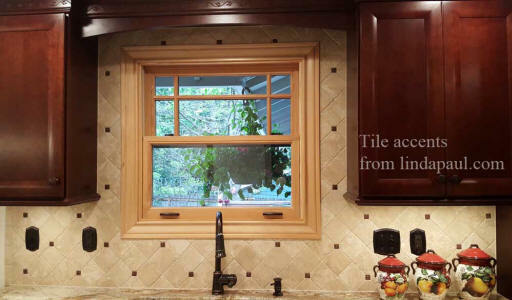 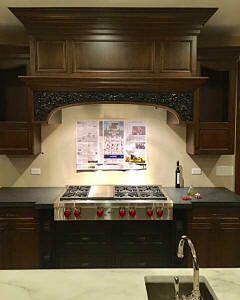 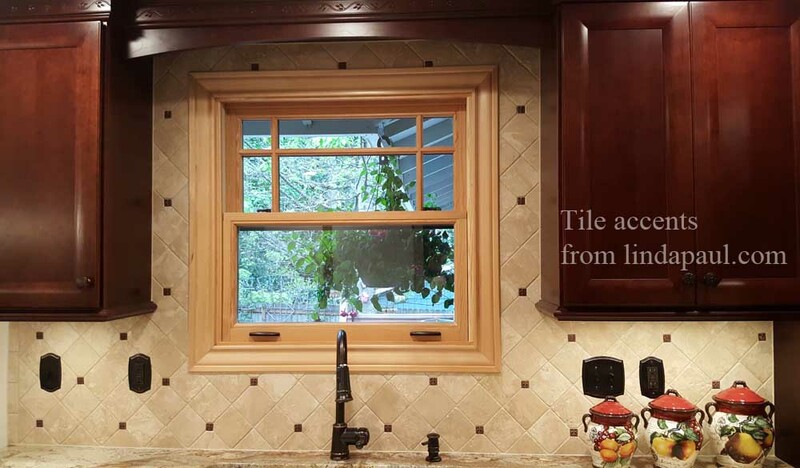 This cherrywood kitchen features our custom Wandering Vine and Vienna grape medallion. 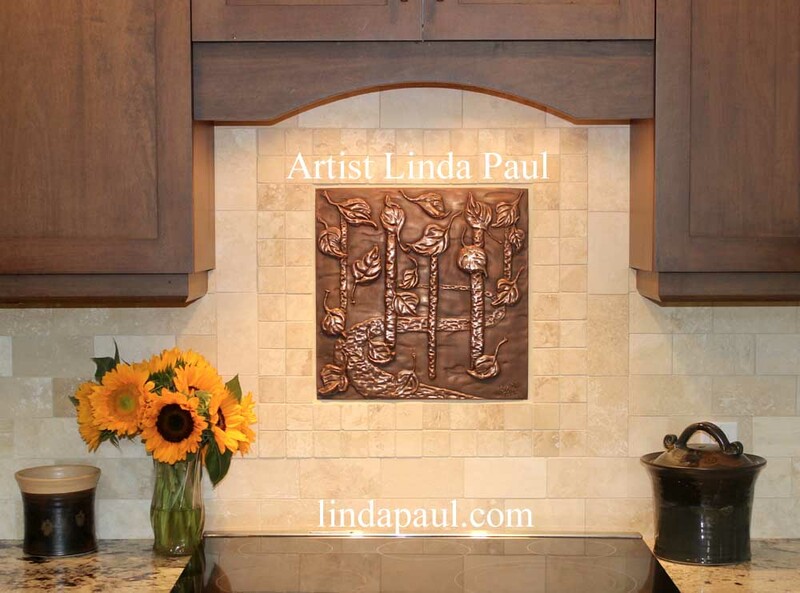 It can be made in pretty much any size. 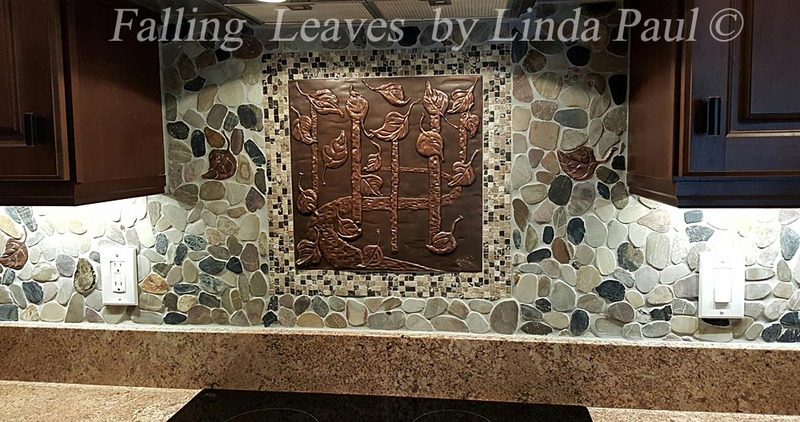 How refreshing is this arts and crafts style backsplash featuring the Falling Leaves copper plaque by artist Linda Paul. It is surrounded by a natural stone pebble backsplash with inserts of arrowheads, trilobites, petrified wood and individual leaf accents. 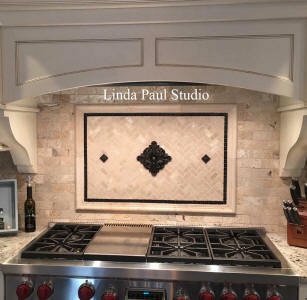 Its a nice design idea when the tile mural backsplash fills the entire space as in this picture of a custom kitchen with Thomasville cherry cabinets. Size of mural in picture is 48" x 30"
"The Tuscany Arch tile backsplash is gorgeous and compliments the decor in the rest of the kitchen. 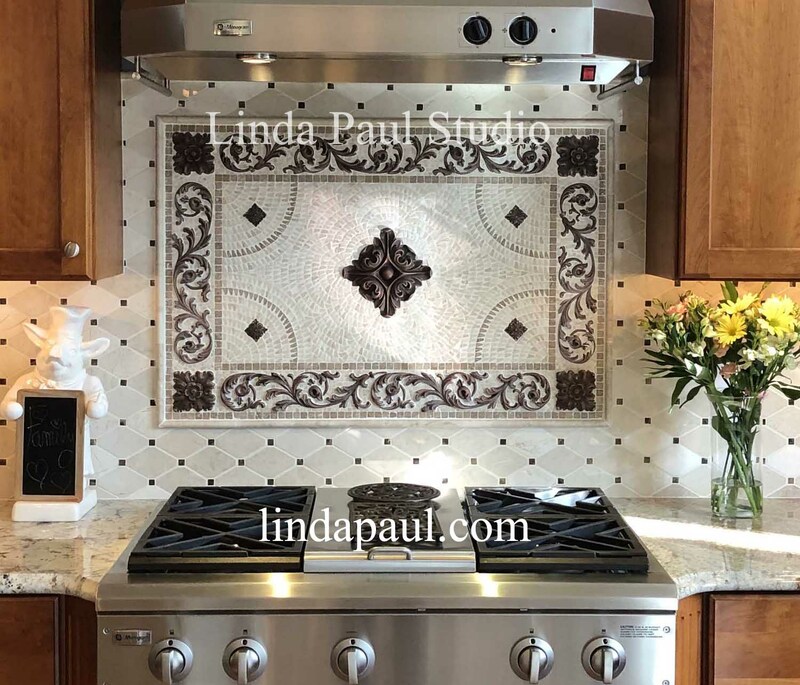 I have received numerous comments on the backsplash on how beautiful the backsplash looks and the high quality of the tiles. 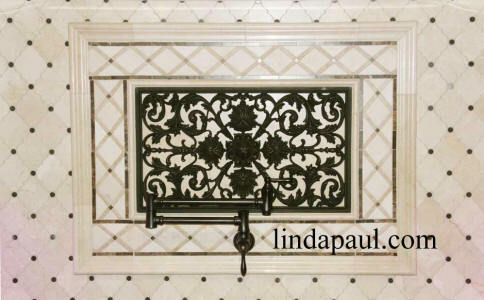 Thanks Linda." 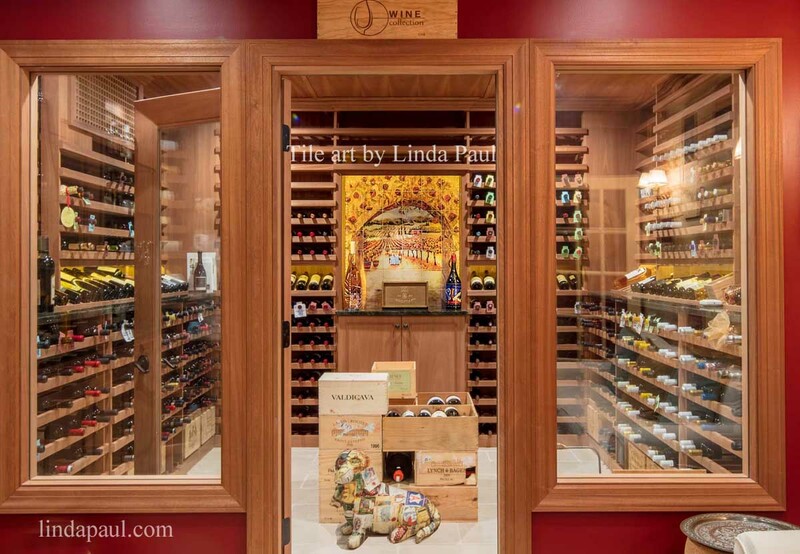 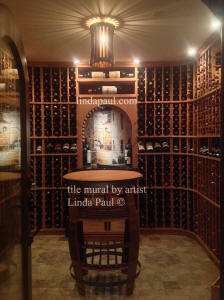 The focal point of the custom wine cellar is my French Bistro marble tile backsplash. 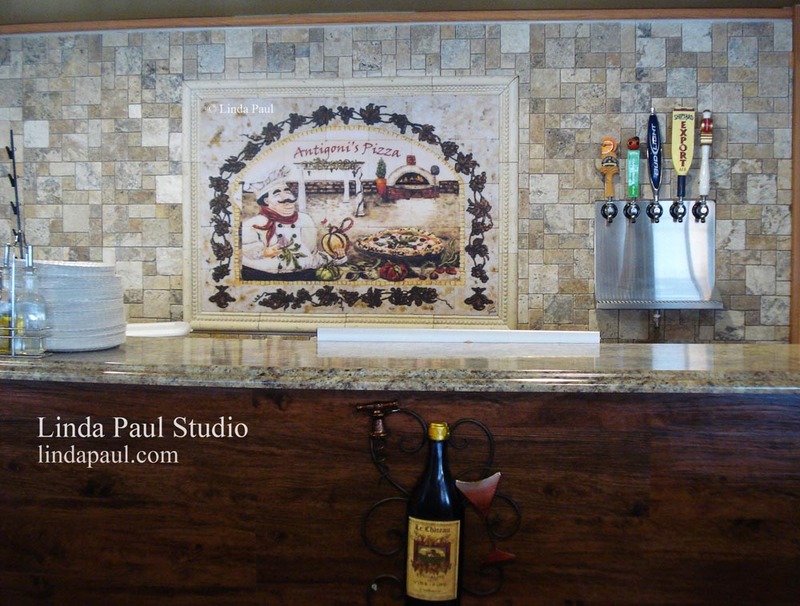 The restaurant signs in the mural were personalized for the customer. The top of the mural was cut into an arch by the installer to fit. 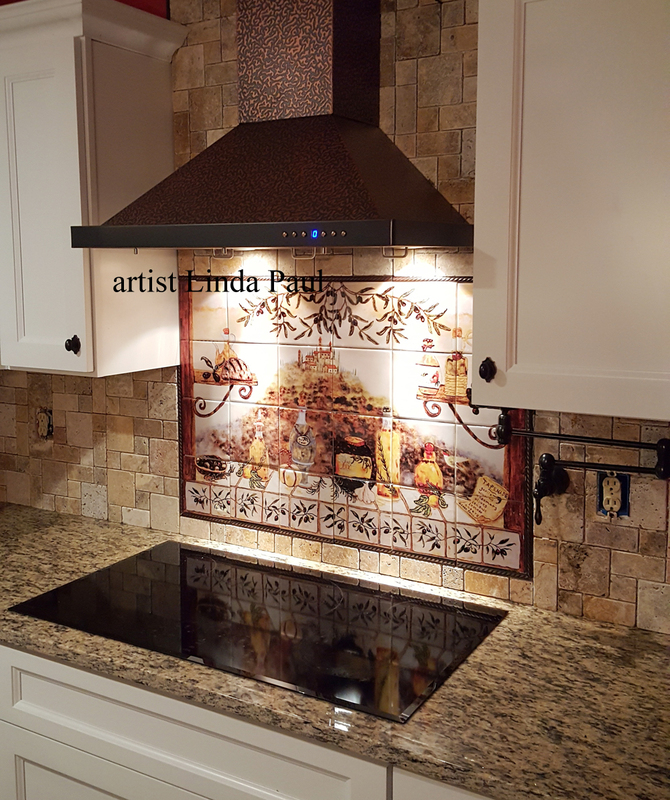 Tuscany in the Mist in 30" x 18" size bordered by metal fine rope liner and 3" x 6" subway tiles that have been creatively turned in horizontal and vertical directions. This tile pattern is unique and fits the space perfectly. 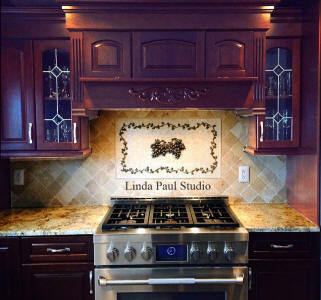 I like how the range area juts out like a little peninsula. From the customer who purchased and installed this mural "Thank you again for your beautiful work. I can't begin to tell you how thrilled I am with the mural. 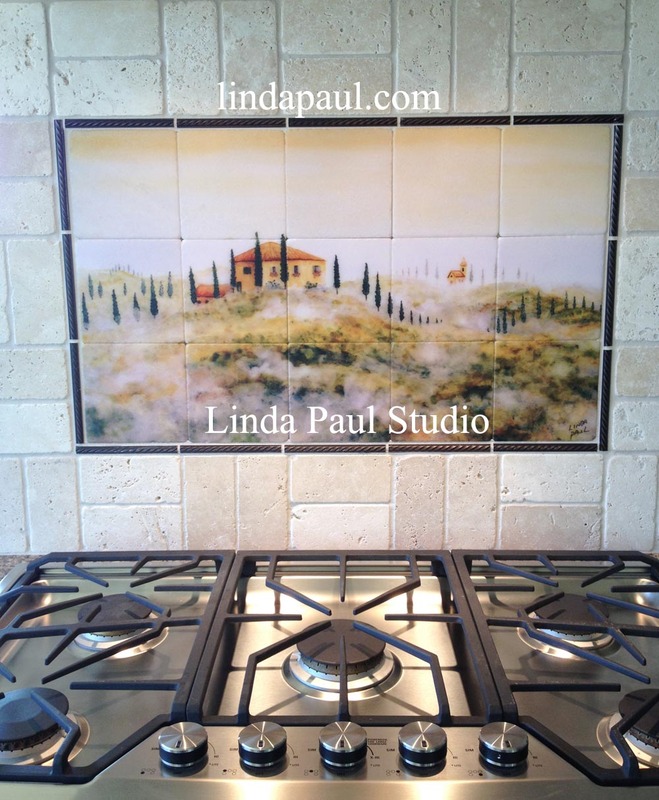 Lisa Kern Milwaulie, OR"
Check out artist Linda Paul's 66" x 36" Tuscany Arch tile mural in our customer's kitchen. 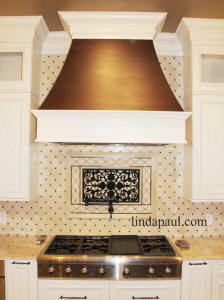 It is bordered by 1" x 12" smooth metal border bar liner in copper highlight polish. 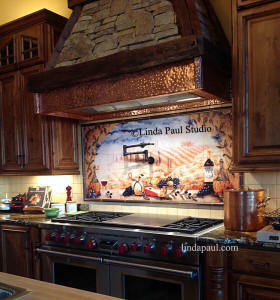 The oil rubbed copper pot filler was placed in the center of the mural and the copper and stone hood is spectacular. You can mix different metal finishes in your kitchen to great effect! Stunning kitchen backsplash design with a custom Chateau grapes mosaic tile and metal medallion from our Studio. 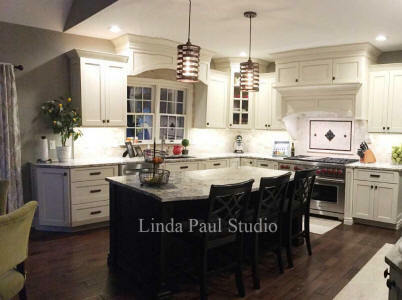 This kitchen combines both contemporary and classic design with beautiful neutral colors. 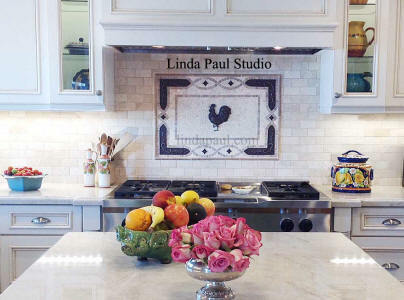 Gorgeous French country kitchen with our Rooster and Sunflowers tile mural stove backsplash. 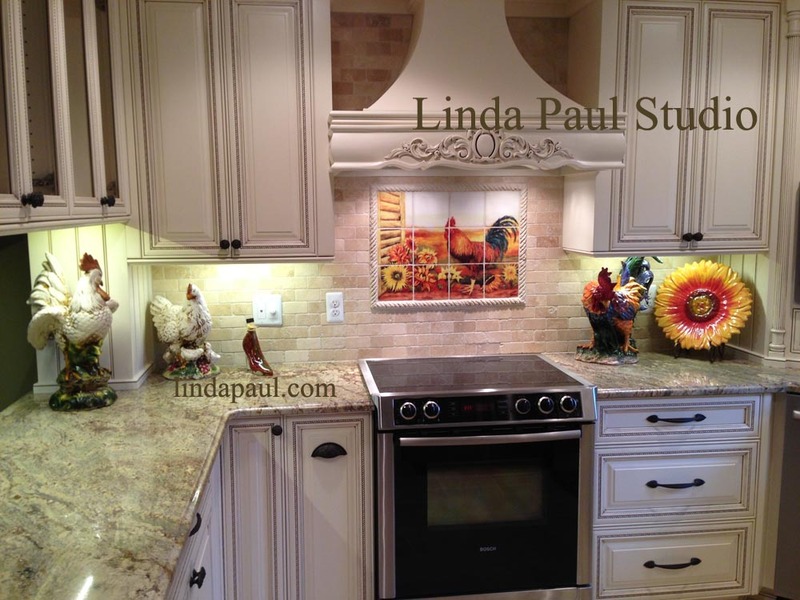 I love how our customer chose the beautiful neutral and timeless cabinets and brought pops of color in with our mural and the ceramic roosters and sunflower plate. The 4" x 2" subway tile for the rest of the backsplash is a hot trend that is fits perfectly in a country french kitchen and the brick shape makes it feel like a farmhouse kitchen in France.